A property owned by Hawk Lou, one of many, includes a Popeyes, a Vietnamese restaurant, and 27 residential units. Photo by Daniel Hirsch. Disclosure: Mission Local was a tenant of the landlord this story investigates for a year and half prior to January’s four-alarm fire. By most accounts, Hawk Lou was a fairly benign presence in the large mixed-use building he owned at 22nd and Mission—a building, that caught fire more than two weeks ago, leaving one tenant dead, one severely burned, and more than 65 homeless. If not always entirely responsive to tenant complaints, he was frequently on site. To us, he seemed like a mostly nice guy. It turns out that this mostly nice guy also owned a lot of property—some 19 properties throughout the Bay Area with an assessed value of roughly $15.3 million, according to public records. Additionally, several tenants we spoke at various buildings have a more complex relationship with Lou than just tenant and landlord. Some are residential tenants who also have businesses housed in another of Lou’s buildings. Several others are also Lou’s employees. Many tenants appear to have made a bargain—they live in rundown and often overcrowded spaces—for cheap rent. In exchange, they don’t complain. Some told us they hesitated to report issues to Lou or to the city for fear of losing the one place they call home. Some were hesitant because they are undocumented, others simply fail to understand that they have any rights as tenants. That means violations can endure for decades because to get any attention from the city, complaints have to be made. “It’s a complaint based system,” said William Strawn, a spokesperson for the Department of Building Inspection. In general, the buildings owned by Lou and held in a trust with his wife, Ketty Fong Lou, were purchased in the 1990s. Several of them are in the Mission and Outer Mission, but there are more in San Jose and Milbrae. A few were inherited in 1999 from his father Abraham, who appears to have started as a butcher in the meat market of the 108-year-old building on Mission and 22nd Street destroyed by the January 28th fire. Hawk Lou also worked as a butcher early on. Few of the apartments appear to have had many improvements. With the exception of a piece of property in Pacifica that sold for $3 million in 2008 and is now a Fresh and Easy, Lou has held onto most of the properties he purchased more than 20 years ago. For many of the longtime tenants in these long-held buildings, their homes are more than a little worse for wear. One of Hawk Lou’s properties on 24th Street. Photo by Daniel Mondragón. Standing on the street outside an eight-unit building owned by Lou at 2734 24th Street, Maria, who asked that her real name not be used, didn’t mince words about the four bedroom apartment in which she and her mother share a room. Maria says in the apartment, that she and her mother share with two other families, there’s no heat, and a window that’s been broken for months. One time when she went to get a pair of high heels from her closet she was shocked to see vivid green mold had accumulated, covering the shoes. “We cannot use heaters because the electricity immediately goes out, we cannot even use the microwave without blowing a fuse,” Maria said. Maria asked that we don’t use her real name because despite the problems at her home she worries about losing it. Having immigrated from Mexico seven years ago, she and her mother only recently acquired citizenship documents, but their names aren’t on the lease and they worry that they don’t have any rights. For the room Maria shares with her mother, they pay less than $500 a month. Now that they have legal documents, and more of a credit history, she hopes they’ll be able to find somewhere else. Lola, another tenant in the same building who also asked that her real name not be used, says she is also terrified of losing the room she’s inhabited with her husband and children since 1999, but she also says the situation in their building is pretty bad. This building isn’t Lou’s only property with problems. At 4758 Mission, a large property that contains two apartments and the San Francisco Muslim Center, that Lou co-owns with an associate named Ken Yee, a tenant told Mission Local about a bedbug infestation and many other structural problems. Both women at 2734 24th Street say they’ve had little interaction with Lou, but deliver their checks to a property manager who lives on 16th Street. Maria said that when she and her mother have contacted this property manager, she has been incredibly resistant to doing anything about the building’s issues. When asked if their building had smoke detectors both tenants said there were none, but Lola installed her own after she had her first child. Over the years, the building department found numerous safety violations involving expired fire extinguishers, combustible materials in hallways, lack of heat, and blocked exits. In the most recent notice of violation from 2010, an inspector found hazardous peeling lead paint, broken windows, and unsafe stairwells. It took two visits from the building department before these violations were handled. As to whether her building has any fire extinguishers now, Maria said definitively that there were none. “The only way for things to change is to call an inspector, and we’ve thought about,” said Maria, but explained that she’s still worried about getting in trouble. She also adds that sometimes complaining to the city won’t solve the problem. In the case of garbage clogging a fire exit several years ago, she remembers city inspectors came into the building, and issued violations which prompted a clean up by the property manager. But a few months later, Maria says the trash was back. “We know nothing is going to change,” she said. Above Espiga de Oro, nine people share a small apartment. Photo by Daniel Mondragón. 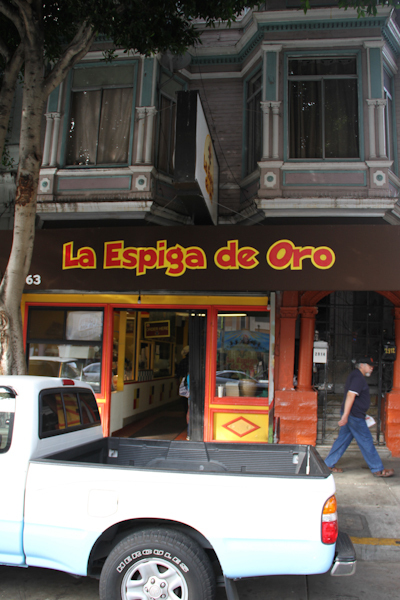 Up 24th Street, above Espiga de Oro and Lou’s own business Low Cost Carniceria, where he is a frequent presence, tenants have fewer complaints. There are also fewer instances of complaints or violations in the public records. “I’ve been here 15 years and I’ve never had a problem,” said Wilmer Acebedo, a residential tenant in the building. Like several others, Acebedo has also been employed by Lou doing painting in other buildings owned by his landlord. A tenant in one of the apartments which houses nine people in five rooms said he’s only had positive interactions with Lou. In the kitchen, he pointed to recently installed counters. The small kitchen is in fairly good shape, though a smoke detector was conspicuously absent from a mount on the wall. “When people heat tortillas, they create a lot of smoke,” he said as to why there were no smoke detectors. He told Mission Local someone had previously been living in the building’s back patio in a temporary wooden shack. The building department’s records indicate a neighbor complained about an illegal structure in the back, though when an inspector arrived two months later they found nothing there. The interior of the building had also been chopped up to create more bedrooms. A wall of painted plywood intersects what appears to have once been a living room. But tenants had no complaints. “There’s no problems with this building,” said Andres, another tenant who has lived in the shared apartment for 10 years and occasionally does construction work for Lou at other buildings. It was a similar scene at 860 Geneva, a three-story building owned by Lou in the Outer Mission. The 1958 apartment complex, which is adjacent to a Popeyes, a Vietnamese Restaurant, and corn dog shop called Batter Up, all in buildings owned by Lou, also has a history of safety hazards, according to fire department records. From the outside, it looks like a slightly run-down motel. During the Fire Department’s most recent visit to that building in June 2014, inspectors found debris blocking escape routes, and hazardous material in the parking lot. Inspectors noticed wire netting and various items stored in the only stairwell to the roof—during a recent visit from Mission Local this stairwell was still blocked with refuse and wire. There have also been instances of expired fire extinguishers. However, tenants we talked to in this building had no complaints, most did their own repair work and appreciated Lou’s patience when their rent payments arrived late. Take the case of Jeffrey Bryant, a tenant who has lived there for 15 years. He called Lou a “good guy” who’s accommodating when it comes to the rent. Bryant did say that when something is broken he fixes it himself, such as when there was a small fire in his apartment and he did the rewiring of a new stove without help from Lou or a property manager. Other tenants in the same building had similar sentiments. They said Lou, and the property manager who lives on the first floor, aren’t pushy when it comes to paying the rent on time, and are mostly responsive to maintenance requests. Others said Lou was always helpful finding relatives and friends housing or work. Ramon, Lou’s employee at the Mission Meat Market and his tenant at 3105 24th Street, has seen firsthand Lou’s ability to assist his tenants and employees by shuffling people around. After a fire destroyed one butcher shop, Lou transferred Ramon and his two co-workers to the Low Cost Carniceria down the street on 24th. Regarding reports that many of the units in the building that caught fire were overcrowded, Ramon, who shares his three bedroom apartment with his wife, brother, sister-in-law, and three children, said it’s not Lou’s issue. “It was his fault for being so nice and for letting people live there,” he said. One tenant who once lived in this building below Ramon’s apartment didn’t find Lou so nice. She and Lou had a lengthy and ugly legal battle. For that story, you can read our third piece in this series here. My attorney has strongly advised that I do not comment on the building and anything related to it at the moment because it could affect the currently processing insurance claims. What had happened is pretty serious, so thank you for your interest, but maybe in the coming future at a later date. Sorry that I cannot help you at this time. In our own experience with Lou, we know he was responsive to complaints about the building’s upkeep. He was also around a fair amount. However, residential tenants on the floor above describe a situation similar to that of many of Lou’s other tenants: tense interactions when it came to fixes; longstanding issues with the building; and single apartments inhabited by many households. Tenant Tony Segovia said that when he communicated with Lou through the building’s property manager about things that needed fixing, “he would get pissed,” and wouldn’t fix things. Eugenia Aldama and her husband who had lived at 22nd and Mission for 40 years, said the building had changed since Abraham Lou (Hawk Lou’s father, who owned the butcher shop on the first floor) took it all over in 1990. Aldama explained that there weren’t the same services as when the previous owner Bill Rosetti was there. She said they did not really know Hawk Lou that well because they didn’t see much of him. In 1993, one tenant filed a petition with the Rent Board regarding substantially decreased services. At the time, the landlord is listed as Abraham Lou. Hawk Lou inherited the building in 1998. Records also show issues with the building similar to those at other properties owned by Lou. Reports of illegal construction in the basement causing damage to ground floor businesses’ walls and floors dot public records for the building from 2007 to 2009. 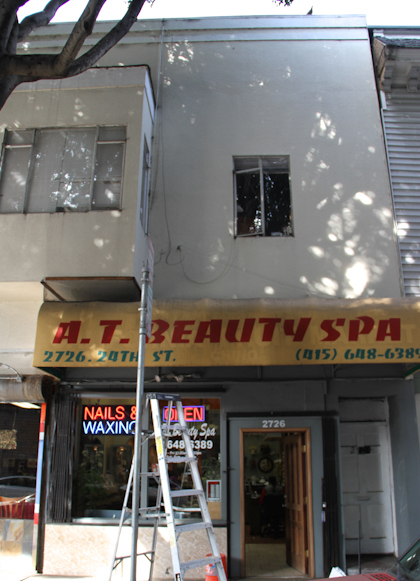 Anecdotally tenants have told Mission Local about faulty wiring and flooding. From 2009 to 2013, fire department inspectors report of “extinguishers past due for servicing,” “fire escapes ladders obstructed by awnings,” blocked exits, alarms without power, and missing fire extinguishers. In its most recent visit from the fire department, which occurred in August 2014, the building passed inspection without remarks. But for a building as old as it was—it was built in 1907—there weren’t so many complaints. While building department spokesperson Strawn did say that there’s “no such thing as an average building,” he said he wasn’t surprised the building at 22nd and Mission had relatively few complaints. 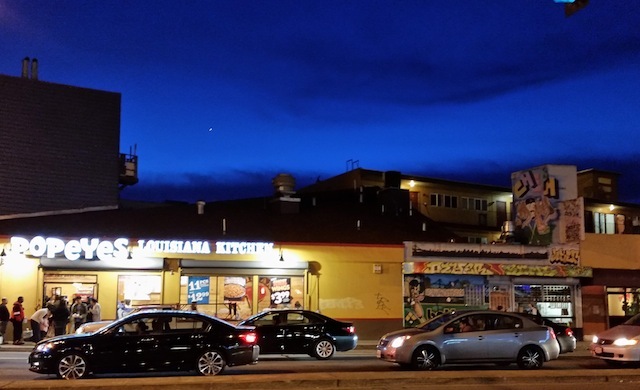 Many tenants just accepted the old plumbing and various other issues as an inescapable fact of living in the Mission District. Most were paying well below market rate, and had been for many years, maybe dividing up a studio by three with each person paying $250 a month. In an increasingly expensive city with a limited housing supply, a building with a fire hazard or two is better than nothing. For tenants who may have issues with their building and are worried about reporting it, you can leave an anonymous tip with the Department of Building Inspection via phone call 415.558.6220 or email DBI.HID.Complaints@sfgov.org. Services are offered in multiple languages. Um, no it isn’t. A building with an apartment with no functioning smoke/fire alarms or detectors puts the entire neighborhood at risk. I live at 22nd and Florida and in the evening of the fire saw a piece of ash sailing through the air down 22nd street corridor. Happily, there was little to no wind that evening wind which is good. You should talk to the SFFD about how fires spread. The Mission hasn’t had a major conflagration since 1906 (if memory serves) but the Mission is a high-density neighborhood with lots of wooden buildings. One fire in an apartment on 24th street could be an utter disaster. When Mr. Lou neglects to bring and maintain his holdings to code, he puts more than his tenant’s lives in danger. Frankly, it shouldn’t be the responsibility of his tenants to bring matters of faulty wiring and locked fire escapes to the attention of the city: any landlord who owns 11 buildings (! really?) should be subject to frequent and announced visits by fire inspectors. Please keep investigating this story. If the City were on it’s game and going after these modern day villains/slum lords, perhaps these types of tragedies would not occur as often. My son resides in a building on Mission not far from the one that burned down that echoes the descriptions above: no heat, bugs, broken everything and a long laundry list of other unclean, unsafe and unhealthful living conditions. These villains know that their residents are not comfortable speaking up so they continue to oppress low income/no income folks. Shame on you, SF City Hall for allowing this type of thing to continue unchecked! Sounds like Mr. Slum landlord Lou should be in prison!